It may sound strange that chiropractic care would be able to treat a skin condition. 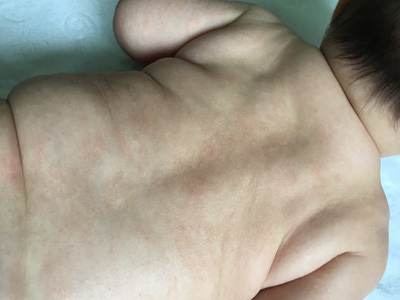 Usually, when you think of chiropractic, back pain, neck pain and sometimes headache treatment come to mind; however, the core of what chiropractic does may affect other disorders, such as eczema. Put simply, skin is a reflection of the gut. We can use testing to find out what you are eating or drinking that is affecting your gut. If your gut’s not clear it’s going to show up in your skin as it’s the largest organ of your body. Many people with eczema take a bandage approach by putting creams and lotions on the outside. Instead, we use chiropractic to offer natural healing from the inside out. Chiropractic focuses on corrected subluxations in the body, mainly in the spinal area. These subluxations are similar to blockages that get in the way of the proper flow of the body’s systems. The immune system is one of these bodily systems that can get its wires crossed when there are subluxations occurring in the spine. By adjusting the vertebrae and aligning it to its proper state of being, the nervous system may improve, which in turn will boost the body’s immune system. Once the immune system is functioning at a high level, then eczema may be reduced, and in some cases, cleared away completely. The vagus nerve (found in the neck) controls the gut so if that nerve isn’t clear you will end up with skin issues. We also adjust the gut (the intestines and the valves) from the outside using our special technique. My husband, Frank, and I anxiously awaited the arrival of our daughter, Clara. After Frank’s experience with eczema, hives, and other skin issues, we wondered if Clara would have the same problems. We breathed a sigh of relief when she was born with smooth, baby soft skin. 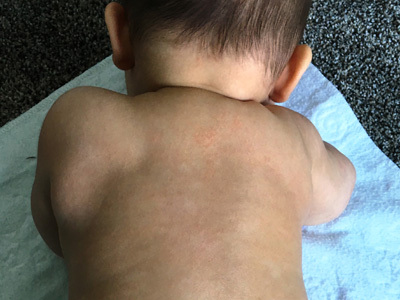 Around two months of age, we started to notice some rough patches of skin on her elbows and feet. Since there was no redness, we thought nothing of the rough patches and made sure to take precaution to heal the dry spots. Within two weeks, the dryness had spread to the rest of her limbs and torso. She was covered in red, dry, and scaly patches, which were accompanied by a terrible diaper rash that we could not get rid of. Frank and I felt defeated as we began to accept the inevitable fact that Clara may experience the same skin issues we had hoped she could avoid. After evaluating Clara, Dr. Anna suggested that chiropractic care was a possible solution for healing her skin. Clara started receiving adjustments three times a week when she was between 3-4 months of age. Within one week, Clara’s skin had improved dramatically. Frank and I were ecstatic to see such fast results! The redness remained, but the roughness was no longer there. 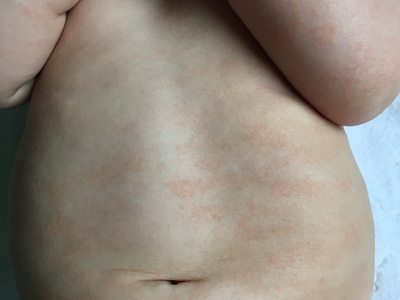 Within two weeks, the redness was almost completely gone, and within three weeks, her skin was back to the way it was when she was born. We continued the adjustments after the skin cleared to be sure that the eczema would stay away. Clara did experience a few minor flare-ups throughout the course of treatment. Due to the KST technique, we were able to work with Dr. Anna and Dr. Ashley to determine a few food sensitivities that Clara had. 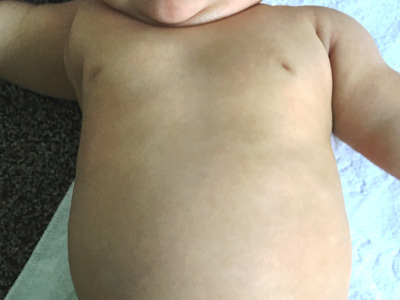 The chiropractic adjustments helped to clear these flare-ups quickly, and after removing the foods from her diet, Clara has not experienced any more dryness or redness. We are so thankful for care tailored specifically to Clara and her needs. This really helped us to not only clear her skin, but also pinpoint specific triggers that may have been contributing. Clara is now a very happy 6 month old. Now that the winter months are among us, Frank and I are happy to know that Clara will not have to endure any itchy, dry, irritated skin. Words cannot express our gratitude for the type of care that our family receives from Dr. Anna, Dr. Ashley, and the office staff. 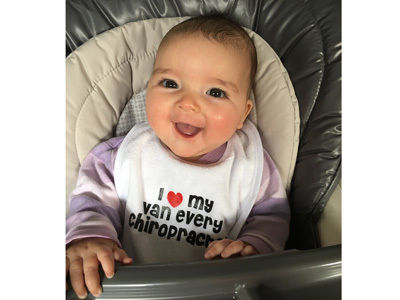 Our goal is to always be a happy and healthy family, and Van Every Chiropractor plays a big part in helping us achieve that goal. If you’d like bothersome eczema to vanish from your skin, contact Van Every Family Chiropractic Center in Royal Oak today to book an appointment!